Flutter is an open-source mobile application development framework created by Google which makes it smooth and easy for to build user interfaces that react fluently in app, while minimizing the amount of code required to synchronize and update app's view. Flutter development is gaining the limelight for building eye-catching native apps. With an evolution, there is always something new that the technological world offers. Beside being one of the most popular search engines, Google has always something new to give to the technology world. 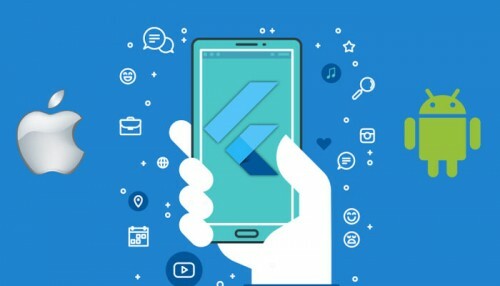 This time its Flutter, Google's mobile application SDK for iOS and Android. This mobile application SDK isn't just quick and open source yet in addition holds capacity for crafting high-quality native interface on cross-platforms. This holds a record time of 120 FPS resulting it to be a reliable mobile UI framework introduced by Google. Oditek Solutions, being one of the top Flutter application development companies has managed to get acquainted with its styles and method. Our team of experts not only help you with A-class solutions of your projects but also extend their support throughout the span of your project. Developers can alternate coding and examine the result directly through the app with the help of Hot Reload feature. It allows quicker debugging and simplifies the process to fix bugs. In more significant manner, the simple process allows for easy testing in the app features to enhance functionality and the richness of the UI. Flutter architecture aims to simplify the development process for developers. By offering integration using other programming languages does makes it easy to adapt. Flutter helps developers by taking away the need for to write different codes for other platforms. A single code works on both iOS and Android platforms. Beforehand the developers had to carry out the testing process separately for the two different platforms, but with the help of Flutter, it only requires a single test for both platforms, making testing quicker and efficient. Flutter’s modern technology allows developers to create a faster and more fluid experience to end users, makes it easier to meet user demands. Beside permitting customization of existing widgets, Flutter empowers developers for creation of new widgets. The rich widget library in the SDK makes it simple to customized a widget rapidly. Cupertino and Material design are two of the most famous widgets that make it conceivable to create applications with stunning and very highly responsive UI. A standout among the best parts with flutter application development services is that the app developers never again need to create numerous codes for distinct platforms. You read that right!! It provides single code for both iOS and Android. The credit to this goes to its own widgets and designs. With the recently launched technology and its powerful rundown of features, the developers can without a doubt serve your end clients with smoother experience. Furthermore, as we probably are aware, better user experience implies more exposure and acceptance. Flutter app development framework is written by Dart, a language that compiles "ahead of time", provides native performance for multiple platforms, smooth animations, and transitions which loads at the speed of 60 FPS. These qualities make dart particularly potential for implementing Flutter. Support and integration are the two factors that are OK with Flutter. Therefore, it has a more extensive scope of plans for your prior tasks besides the ones that starts from the beginning. According to the sine qua non, the gigantic system of built-in utilities helps you to create permutations of numbers of different custom scales, arcs, pies, pillars. This works on when your intention is to communicate the analysis to the peak. By following the rule of ‘write once and use anywhere’ for development which is saving a lot of time and effort and gives you faster and quicker access. Flutter becomes into a child for the developers because of its ability to integrate. Its smart and savvy architecture makes development a fun game and in this way, thus, gives a constructive procedure to the clients. Facilitating communication results in improving mid phases. At Oditek Solutions, we assign a dedicated team of experts to every client and project. This helps us build better solutions for them. With us, you get decades of industry experience under a single roof. This empowers us to serve you with excellence. Every mobile has its own set of needs. With our innovative and custom approach, your mobile app gets the perks it deserves. We have a devoted support team, which ensures that all your queries are resolved on a priority basis. Our team of experienced app developers is bestowed with an invincible blend of creativity which helps us build creative solutions for you. For every project we initiate, our team first ensures doing thorough research to build custom solutions. We believe that if the app development process isn’t accomplished keeping in mind the industry you belong; the results won’t be what your business deserves. To assemble lovely yet advanced UI plans, Flutter offers a successful as stage designs. And application engineers will have to a great degree adaptable APIs to utilize all their innovativeness. Flutter does come with an effective and unmatchable GPU rendering UI that enables it to work on the current interface and run as interoperable platforms as well. Utilizing customized theme that craft site more attractive ultimately engage customers and boost up sales. Beta version comes with expensive tools that offer a scalable set of widgets are improved. In the app SDK, Hot Reload facilitate with new features that help to access the widget seer to perform on the dynamic interface with an ease. Google Flutter application developers would be able to localize their native app globally that allows them to use it over the globe.